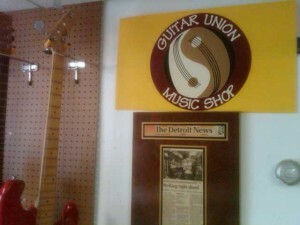 We are in the process of migrating all Guitar Union information to www.GuitarUnion.net. We offer guitar repair and a full range of services to maintain and repair Guitars, Basses, Mandolins, Banjos, Violins, Violas, Cellos, and more. We do free estimates on all work not of an electrical nature. Instruments must be dropped off to either location in Grosse Pointe Woods or Canton between the hours of 2pm and 8pm Monday – Friday or 10am-4pm on Saturday. Guitar Union Music Shop, located inside Grosse Pointe Music Academy, offers full maintenance and repair services for your acoustic and electric stringed instruments. We offer free estimates and fast turnarounds times and ensure a positive experience when working with you instrument. David Bolla, our in-house certified Luthier and Repair Technician, is a graduate of Roberto-Venn School of Luthiery and has worked on thousands of guitars in the Metro Detroit area. Whether professional or amateur, his precision and efficiency keeps musicians coming back for routine maintenance and repairs. Acoustic and Electric services include, but are not limited to: restringing, cleanings, set ups, nut replacement, saddle cut, saddle replacement, bridge glue, bridge planning, bridge replacement, fret level, fret replacement, crack repair, installing pickups, custom work, etc. To learn more about our guitar repair services please feel free to call 313-926-8742. Visit StewMac.com to shop for guitar repair tools.